We live in a townhouse, during a cold snap, the paint peeled off a number of the metal clad front doors in our complex. The strata corporation chose to replace the doors rather than re-paint them and hired a self employed renovation contractor to do the work. I was appalled at the quality of his work. After our new door was installed and the contractor had left I was horrified to see that he had taken a hammer to the strike plate in order to “adjust” it to line up with the lock and to bring the door tight to the weather stripping. I was especially horrified because I am a joiner and finishing carpenter by trade and not long ago had replaced the jamb and carefully installed this strike plate. One of the things my father used to often say was that any job worth doing is worth doing well. Or putting it another way, if a job is not worth doing well, it is not worth doing at all. This is a philosophy that, evidently, a lot of people don’t agree with. I am thinking specifically of people working in the construction and renovation industry. Generally, the quality of construction In Vancouver and the lower mainland of British Columbia is good and much of it is very good, however, unfortunately, a significant proportion of new construction and renovation work is of poor to very poor quality. As a home and property inspector, one of the things I do for my clients is to evaluate not just the condition of a home or commercial building, but also evaluate the quality. Every building has a story. The story is revealed by a methodical inspection of all the visible components. Evidence of poor workmanship is a significant clue to understanding this story. Some may say that things like poorly installed hardware are only cosmetic and a matter of personal taste. I disagree. The strength and durability of a strike plate depends to a large extent on a tight fitting mortise. If it is surface mounted or part of it is in the mortise and part of it out, the only thing holding it in place are the screws. 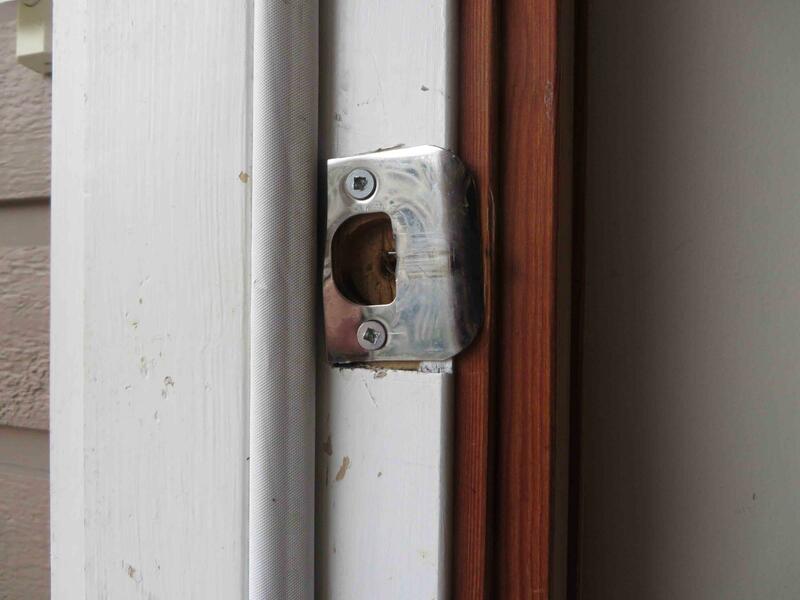 Over time, the opening and closing of the door may cause the screws to loosen, the strike plate will move and the door will not latch properly. So why do some people working in the construction and renovation industry produce this type of poor quality work? Why do so many builders and home buyers accept poor quality work? And if the home you are considering buying is a new home? How will your New Home Warranty apply? I will save these questions for a future discussion. This door / toilet conflict is quite likely the result of disfunctional relationships between the designer, builder and trades people. Homes are not like most products we buy. In most cases, they are built one-off, on site rather than mass produced in a controlled environment. Once built, after the occupancy permit has been issued, they are subject to all manner of alteration and renovation, sometimes with permits and often without. Building and renovation projects can be very complex, involving many people performing various roles. A lot can go wrong. The success and ultimate quality of a project is influenced by many things but much of it comes down to relationships. Successful, high quality projects are more likely to result if the relationships between all those involved are functional, meaning that there is effective communication between everyone working on the project, designers, managers and trades. Other types of relationships also effect the success and quality of home building projects, for example, the relationship that the builders and trades-people have with their work and with the community, through their work, or cultural relationships. One of the things I have noticed in performing many inspections throughout British Columbia is that the quality of construction varies considerably from one area to another. I am thinking mostly of what we traditionally call workmanship. In general I find the quality of workmanship to be higher in the smaller communities than in the Greater Vancouver region. One of the reasons for this may be that builders and trades-people have a closer relationship with their communities in the smaller towns. In smaller communities the relationship can be quite close. In the larger communities it can be distant and impersonal resulting in less accountability.